Remedy Pro Off Loading Shoe (orthowedge healing shoe),Helps in reducing forefoot pressure and accelerates the healing process. Helps in reducing forefoot pressure and accelerates the healing process. 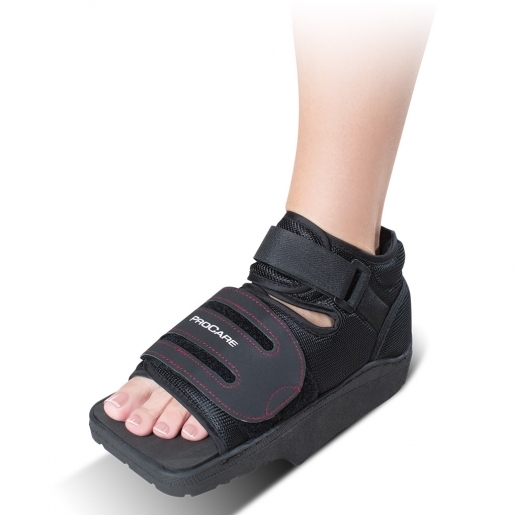 The Remedy Pro Off Loading Shoe helps in reducing forefoot pressure and is used for Forefoot Trauma, Post Surgical Healing, Diabetic Ulcers or Wounds. The wedge design promotes healing by transferring weight behind the MP joints and reducing pressure on the forefoot. The off-loading effect allows wounds under the metatarsal heads or toes and post-forefoot trauma to heal faster. Easy Forefoot Closure: Wide, removable forefoot closure strap can be easily adjusted for maximum security without buckles. Wedge Design: Reduces forefoot pressure by shifting weight to midfoot and heel. Square Toe Box: The square toe provides toe protection and an improved fit. Durable sole: Mid foot & heel tread provide traction where patient needs it most for safety and support. Padded Liner and Adjustable Ankle Strap: Ankle strap helps in positioning the heel and the padded liner reduces friction thus providing support and protection. Seamless Padded heel: Seamless heel negates the chances of ulcerations and wounds due to elimination of friction. Please refer to the size chart in drop down under sizes to sleect your correct size. Sizes mentioned are Shoe Size. An absolute delight to order from this website for may reasons. The site is very user friendly and makes it easy to order, the products are very well explained for you to get a better insight about the product that you are ordering, a wide range of products, excellent customer service team, fast delivery. I received mine in 3 days after I ordered. Above all, the product is really good. I had ulcers under my toes and was just unable to walk in my regular shoes. This off loading shoe really reduces the pressure under the toes and raises it so that you can walk around freely and pain free. I will definitely re-order from this website whenever needed and will also recommend it to my friends. Great website. I loved my shopping experience which was very easy. The service is excellent. I have just received my shoe today and I am yet to try it on. I hope it turns out to be great and relieves my pain. I will be back with another review soon. User friendly website with great price range and a variety of products. I needed this off loading shoe for quite some time now and finally decided to look around online to see the best price. This site offers it the cheapest. The ordering was also very easy, just took me few minutes to complete my order. Now I am just waiting for my product to arrive. The previous reviews increases my expectation level of the product and the delivery time frame. I hope to receive mine well in time.